There are few breakfasts that cannot be improved by the addition of hot, toasted bread with butter, jam, or jelly. Even fewer do not benefit from the addition of a toasted English muffin, crumpet, or halved bagel with your favorite spread. Toast with breakfast is a tradition around the world that has been made more convenient by the modern electric toaster, and the continued evolution of the toaster has brought numerous convenient features and additional capabilities. Most households with more than one person prefer a 4-slice toaster, as it can handle more food simultaneously for preparation than 2-slice toasters. The additional features on a 4-slice toaster are also significantly more convenient and useful than the average 2-slice model, too. Let’s take a look at how to find the best 4-slice toaster for your budget and household, as well as a few models that offer the best value overall. 2 How Does a Toaster Work? A toaster is a household appliance originally designed for toasting slices of bread cut from a loaf. With the advent of pre-sliced bread, toasters adapted to function more efficiently in combination with the newer slice sizes. Eventually, people began to want to toast more than just bread or English muffins, and toaster designs evolved once again to accommodate frozen waffles, bagels, and toaster pastries. As more and more households began to purchase toasters, they became something of a necessary fixture in the modern home alongside the refrigerator, a dishwasher, and an electric oven and cooking range. As their usefulness grew, more and more people began to buy more than one toaster or request 4-slice toasters from manufacturers to meet the demand for toasted breakfast goodies in their home every day. After all, making everyone two slices of toast in even a four person household took some time using a four slice toaster. 4-slice toasters could also accommodate larger food that was growing in popularity such as bagels and english muffins, and the larger frame also allowed designers to add more features for temperature and time. Today, the 4-slice toaster is considered the standard model for most families and households of more than one person. 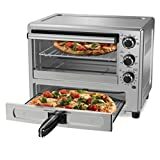 However, if you want an appliance that can accommodate many different types of food, from leftover pizza slices to frozen chicken nuggets, a toaster oven is more suitable for your need. 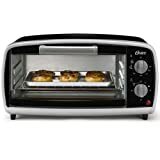 Check out Toaster Oven vs. Toaster to see what both appliances have in common and how they are different. 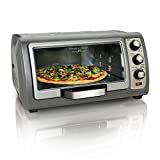 If you prefer a toaster oven, you can check out our buyer’s guide and reviews on best toaster ovens under $100 and best toaster oven. Related: What is a Toaster Oven Used For? An electric toaster functions by using panels of electrical heating elements in an enclosed metal chassis to toast or broil both sides of a slice of bread at a time. The slices rested on spring loaded panels that were lowered and latched into place to activate the heating elements A simple thermostat device was used to release the panel catches when the inside of the toaster reached the appropriate temperature, cutting power to the heating elements and raising the slices of bread halfway above the top of the toaster slots so it could be extracted safely. Originally, 2-slice toasters came equipped with 4 heating element panels to toast two slices of bread, and modern 4-slice toasters use 8 heating element panels. The 2-sided heating function is what makes the toaster useful for rapidly heating and crisping other kinds of food as well. If you want versatility for what you can prepare in your toaster, you need to make sure that it has sufficiently wide slots in the top to accommodate the widest variety of toaster-prepared foods. Anyone who plans to toast bagels regularly definitely needs the widest possible toaster slots. Otherwise, your bagels are more than likely to get stuck when popping back up and burn as opposed to being a perfect crispy golden-brown. Most people are not going to cook the same food in all four slots. Typically, you may prepare two slices of a bagel in one set, and maybe two slices of toast or some pastries in the other. However, the temperature and cooking requirements are going to be different for each set of slots. You are going to want to be able to control how long and how hot each set of slots cooks for so that you can prepare different kinds of food at the same time. Presets are a wonderful addition to any toaster because they eliminate the learning curve for getting your food the way you want it the first time. For example, many 4-slice toasters have a “toast”, “pastry”, or “bagel” preset button you can press to get your food just right the first time. Nobody likes a trial-and-error process when it comes to breakfast, so look for multiple toast functions when shopping for a 4-slice toaster. How dark or light do you like your toast? If this is of importance to you, you will need to make sure that your toaster comes equipped with a proper shade dial of some kind. Actual results can vary based on the settings and what presets you activate once you start toasting, but most people like their toast a certain way, and the ability to control how toasted your toast turns out is definitely a must have feature. Toasters that don’t have high lift carriages are only really good at preparing two things: burned fingers and frustration. 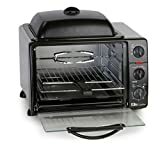 A high-lift carriage ensures that whatever you are toasting raises the bread, pastry, bagel, or waffle high enough above the toaster slots that you can pick it up easily without burning your fingers on the heating elements or carriage frame. It’s also a must-have feature if you like a freshly toasted English muffin on a regular basis. This feature is very important if you want to easily keep your toaster clean and free from pests. A removable crumb tray makes cleaning quick and easy, and it helps cut down on the number of insects and other small creatures that are on the prowl for something to eat in your kitchen. Best of all, many crumb trays are also dishwasher safe, making it even easier to remove burnt or sticky material. Avoid toasters with plastic housing (they tend to warp and dent easily), and make sure that your toaster is guaranteed to last for a number of years if you want to get your money’s worth. Thermostats and heating elements tend to be the first components to go on poor quality toasters, so focus on the quality of these items in particular. Stainless steel, die-cast, and chrome are all popular choices, and they add a touch of modern aesthetic to your kitchen, too. Make sure that the dimensions of the toaster are going to work in your kitchen space. A 4-slice toaster with all the features you need or want is not going to do you any good if it doesn’t fit on the counter. You also want to consider how much the toaster weighs in case you need to move it frequently, as some 4-slice toasters can weigh as much as 8-9 pounds. A long-time manufacturer of kitchen appliances with an exceptional reputation for quality, Cuisinart CPT-340 Compact 4-slice toaster is ideal for households that need the 4-slice capacity but have limited space for storage and use. The attractive all-stainless steel housing protects the internal workings and dissipates heat more efficiently, and the 1.5-inch wide toaster slots provide exceptional versatility for preparing just about any kind of toaster-prepared food you desire. The dual-control shade dials have six different settings, and there are three preset buttons for bagels, defrosting frozen waffles, and reheating. Additionally, this toaster comes with a slide-out crumb tray for keeping your toaster clean with minimal effort. Cuisinart also provides a 3-year limited warranty on the CPT-340, which covers general equipment failure within the first three years of ownership. Make sure to mail-in your warranty card or register online to protect your investment. Check out full Cuisinart CPT-340 4-Slice Toaster Review. This unique 4-slot toaster comes with a particularly useful bonus feature: an egg cooker and meat warmer. Now you can make yourself a balanced breakfast with extra protein for more energy without even turning on the stove. The egg cooking tray can be used to make scrambled or poached eggs in 4 minutes,, and use the included basket to make soft or hard boiled eggs. Feel like adding some pre-cooked bacon or sausage to your breakfast? Pop it in the meat tray for an easy and delicious side. Additionally, the TEM4500W also wide toaster slots for accommodating even bagels and frozen waffles, and the dual control shade dials ensure that your toasted food is just the way you like it. You can also use the preset buttons for better preparation of frozen toaster food and bagels, and it has an option to reheat cold toast without burning or browning it further. In terms of convenience, quality, and ease of use, it really doesn’t get much better than the West Bend TEM4500W Egg and Muffin Toaster. Check out a full review of West Bend TEM4500W Toaster. An exceptionally convenient and high-tech toaster designed to make the perfect slice, bagel, or muffin every time, Cusinart’s CPT-440 is a more a work of art than a simple kitchen appliance. In addition to making it look gorgeous sitting on your countertop, the all-stainless steel housing protects the delicate internal mechanisms and dissipates heat more efficiently. 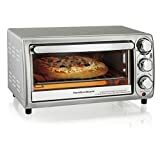 The front panel has a backlit LCD display that offers a countdown feature for your toast, and there are numerous presets that can be programmed for bagels, defrosting, and reheating. Additionally, the dual independent shade controls are digital and all 7 shader options can be programmed right on the front panel. The 1.5-inch slots allow you toast everything from thick french toast slices and sliced bread to bagels and toaster pastries. Moreover, the lift of this toaster is motorized to allow for quiet and secure raising and lowering and raising of your food into and out of the toasting chamber. Better still, the motorized lift also raises your toast high above the top of the toaster slots, making it easier to extract without burned fingers or broken pieces of food falling back down inside the toaster. All in all, this is definitely a premium-quality, full-featured 4-slice toaster that will make every breakfast a delight for years to come. Check out our full Cuisinart CPT-440 4-Slice Toaster Review. A high end product with high end features, the BTA840XL from Breville is a smart toaster for those who love their morning toast and want it prepared right the first time. This 1800-watt toaster features a beautiful brush-finished die-cast housing that adds an elegant modern look to any kitchen. All features are controlled from the LED backlit multifunction panels on the front and top of the front face of the toaster, including the motorized automatic lower and raise function and cancel controls. Dual independent shader controls are adjusted using slide levers, and LEDs illuminate your current setting so you don’t accidentally overcook your toast or bagel. Presets for bagels, defrosting, and reheating without browning or burning are controlled on the top panel, and also illuminate via LED backlight when activated so you know what settings you currently have active. Best of all, the preset controls also have a lift-and-look feature that let you check on how brown your toast or bagel is getting without burning your fingers. The overall design, features, and functionality of this toaster definitely put it in a class by itself in terms of value and quality. If you are in the market for a luxury toaster that can prepare 4-slices of toast to perfection every time, the Breville BTA840XL should be topping your list. ✓ Die-cast all stainless steel housing in brushed metal finish. ✓ LED illuminated controls help you quickly verify you have the right presets for each side of the toaster. ✓ Unique lift-and-check preset lets you keep an eye on your toasted treats’ progress as it is cooking. Known for their high end kitchen products, KitchenAid’s KMT4203OB 4-Slice Pro Line Toaster would be equally at home in your kitchen or the local coffee shop for continuous all-day use. It doesn’t get more premium quality than a KitchenAid 4-slice toaster, and this toaster definitely goes to great lengths to uphold KitchenAid’s reputation. In addition to an automated motorized lift for lowering and raising your toasted treats to an ideal height, this toaster also keeps your toast warm automatically without over-browning or burning anything. Its dual function shader controls also have 7 settings to get your toast just the way you like it, and the preset buttons make bagel and frozen toaster food prep quick and easy. When you want your toast right the first time, and you want to buy one toaster for possibly the rest of your life, you want to buy a KitchenAid KMT4203OB. Overall, choosing the right 4-slice toaster for your kitchen comes down to three things: minimal footprint, features, and versatility. If you are looking for a 4-slice toaster that addresses all three criteria, the Cuisinart CPT-440 is definitely the best overall value choice for anyone shopping for a 4-slice toaster. It features exceptional controls and presets, prepares toast to perfection, and can accommodate even larger toaster foods like thick-cut french toast and bagels. Best of all, the removable crumb tray makes this one easy-to-clean, convenient toaster. When shopping for your 4-slice toaster, definitely look at the Cuisinart CPT-440 before you look at anything else.